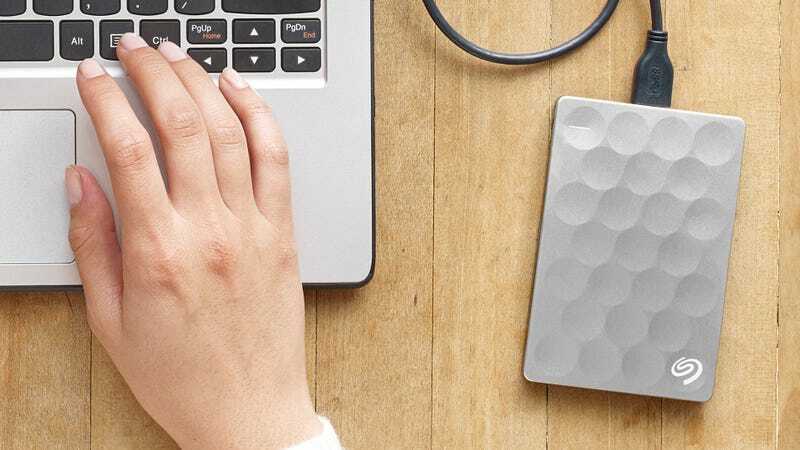 Seagate’s Backup Plus Slim is one of the best portable drives you can buy because it perfectly balances size, capacity, and price. And now there’s even more reason to opt for Seagate’s portable storage offerings because its new Backup Plus Ultra Slim is 2.5 millimeters thinner. In the grand scheme of things that’s not exactly a dramatic decrease in size, and odds are you won’t even feel those missing 2.5 millimeters when you slip the 9.6-millimeter thick Backup Plus Ultra Slim into your pocket. But when available sometime in the next few months, presumably priced similarly to the existing Seagate Backup Plus Slim, the svelter drive will come with a new gold or platinum dimpled finish for those who consider an external drive a fashion accessory. The Backup Plus Ultra Slim also comes with 200GB of Microsoft OneDrive cloud storage for two years at no extra cost. But if two terabytes just isn’t enough room for your cat photo collection, Seagate will continue to offer its Backup Plus and Backup Plus Fast drives in four terabyte options—just without the thin.